For a planet, this would be like a day at the spa. After years of growing old, a massive planet could, in theory, brighten up with a radiant, youthful glow. Rejuvenated planets, as they are nicknamed, are only hypothetical. But new research from NASA's Spitzer Space Telescope has identified one such candidate, seemingly looking billions of years younger than its actual age. "When planets are young, they still glow with infrared light from their formation," said Michael Jura of UCLA, coauthor of a new paper on the results in the June 10 issue of the Astrophysical Journal Letters. "But as they get older and cooler, you can't see them anymore. Rejuvenated planets would be visible again." How might a planet reclaim the essence of its youth? Years ago, astronomers predicted that some massive, Jupiter-like planets might accumulate mass from their dying stars. As stars like our sun age, they puff up into red giants and then gradually lose about half or more of their mass, shrinking into skeletons of stars, called white dwarfs. The dying stars blow winds of material outward that could fall onto giant planets that might be orbiting in the outer reaches of the star system. Thus, a giant planet might swell in mass, and heat up due to friction felt by the falling material. This older planet, having cooled off over billions of years, would once again radiate a warm, infrared glow. The new study describes a dead star, or white dwarf, called PG 0010+280. An undergraduate student on the project, Blake Pantoja, then at UCLA, serendipitously discovered unexpected infrared light around this star while searching through data from NASA's Wide-field Infrared Survey Explorer, or WISE. Follow-up research led them to Spitzer observations of the star, taken back in 2006, which also showed the excess of infrared light. At first, the team thought the extra infrared light was probably coming from a disk of material around the white dwarf. In the last decade or so, more and more disks around these dead stars have been discovered — around 40 so far. The disks are thought to have formed when asteroids wandered too close to the white dwarfs, becoming chewed up by the white dwarfs' intense, shearing gravitational forces. Other evidence for white dwarfs shredding asteroids comes from observations of the elements in white dwarfs. White dwarfs should contain only hydrogen and helium in their atmospheres, but researchers have found signs of heavier elements — such as oxygen, magnesium, silicon and iron — in about 100 systems to date. The elements are thought to be leftover bits of crushed asteroids, polluting the white dwarf atmospheres. But the Spitzer data for the white dwarf PG 0010+280 did not fit well with models for asteroid disks, leading the team to look at other possibilities. Perhaps the infrared light is coming from a companion small "failed" star, called a brown dwarf — or more intriguingly, from a rejuvenated planet. 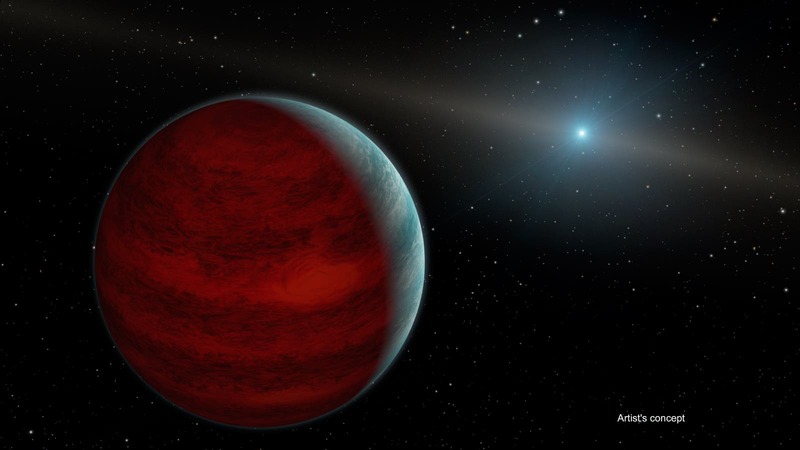 "I find the most exciting part of this research is that this infrared excess could potentially come from a giant planet, though we need more work to prove it," said Siyi Xu of UCLA and the European Southern Observatory in Germany. "If confirmed, it would directly tell us that some planets can survive the red giant stage of stars and be present around white dwarfs." In the future, NASA's upcoming James Webb Space Telescope could possibly help distinguish between a glowing disk or a planet around the dead star, solving the mystery. But for now, the search for rejuvenated planets — much like humanity's own quest for a fountain of youth — endures. The image at the top of the page is an artist's concept showing a hypothetical "rejuvenated" planet — a gas giant that has reclaimed its youthful infrared glow. NASA's Spitzer Space Telescope found tentative evidence for one such planet around a dead star, or white dwarf, called PG 0010+280 (depicted as white dot in illustration). Jupiter's Moons –"Hint at Life on Alien Moons of Gas Giants"